Are you tired of doctor visits that end with yet another prescription but no long-term solution? While modern medicine has its place, many people are suffering from health conditions that need deeper investigation. Dr. Daniel Geck practices functional medicine at the Restorative Wellness Center in Ann Arbor, focusing on discovering the underlying cause of disease or pain for every one of his patients. Dr. Geck founded the Restorative Wellness Center in Ann Arbor, Michigan, as a direct result of his own struggles with chronic illness at a young age. He suffered with fatigue, muscle breakdown, and digestive problems. These afflictions would not resolve on their own, yet no one seemed able to find the actual cause so it could be corrected. Identifying the hidden barriers to his own healing process was a journey Dr. Geck was prepared to take. After much study and research, he addressed his own health problems through the many arms of functional medicine. Finally, Dr. Geck felt the improvement he had long been seeking. The experience made him determined to prevent others from living with pain and discomfort like he did. Since 2006, Dr. Geck has offered the highest standards of chiropractic care and clinical nutrition to patients at his functional medicine practice. He aims to provide a natural, restorative healthcare experience for every patient through a non-invasive, non-surgical, and non-drug approach. Each Restorative Wellness Center patient undergoes a program customized to their needs. At the heart of every treatment is the goal of reversing chronic symptoms in a natural way without the use of harmful drugs or surgery, if they can be avoided. Dr. Geck’s programs elevate normal functions, putting the body in an optimal state for healing. Our bodies are incredibly resilient – Dr. Geck wants to give your system the chance to heal itself through deliberate and thoughtful alterations to lifestyle, environment, and nutrition. Dr. Geck received his undergraduate degree in exercise science from Eastern Michigan University where he was part of the wrestling team. He moved on to Palmer College in Davenport, Iowa, where he received his doctoral degree in chiropractic medicine. His involvement in wrestling continued during his post-graduate education, when he volunteered as a wrestling coach for a local high school and received great experience working with active, performance-minded athletes. 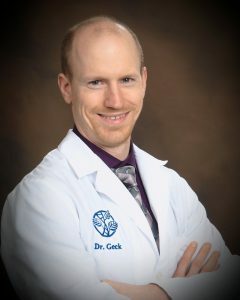 From participating in chiropractic volunteer programs abroad to serving his Ann Arbor community by regularly offering free lectures on topics of functional medicine, Dr. Geck is dedicated to spreading the message that wellness is achievable. He has over 300 post-doctoral training hours of training in handling neurotoxic illness, thyroid illness, autoimmune disease, hormone imbalance, abnormal metabolism, and digestive problems. One of Dr. Geck’s strongest passions is clinical nutrition. Through his education and experience, he helps people naturally recover from symptoms of hypothyroidism, fibromyalgia, brain fog, depression, irritable bowel, allergies, and more. Dr. Geck has 100+ hours of training in disorders of the spine, joints, and nervous system and he is certified in Advanced Muscle Integration Technique (AMIT) which addresses many types of joint and muscle pain. He has official training in Neurological Integration System (NIS), which corrects proper nerve communication to heal many types of pain and symptoms, including spinal disc bulges and herniation. It is possible to find the reasons behind unexplainable symptoms. Through a systematic approach, the body can become balanced and put into an optimal state of healing. It is possible to reverse the symptoms of your disease once and for all, without medications and their side effects. Correcting core metabolic imbalances will resolve a host of symptoms without side effects. The interpretation of laboratory test results goes deeper than looking for disease markers – it’s essential to identify imbalances and patterns of dysfunction that clearly show the root causes of suffering. Addressing root causes of pain or chronic afflictions can help prevent problems from progressing into serious illnesses. You can feel better. You don’t have to live in pain. Contact the Restorative Wellness Center in Ann Arbor if you are ready to find a healthier, more effective path to wellness.